The uniqueness of seeded blown glass gives the Motif Table Lamp character and distinction. 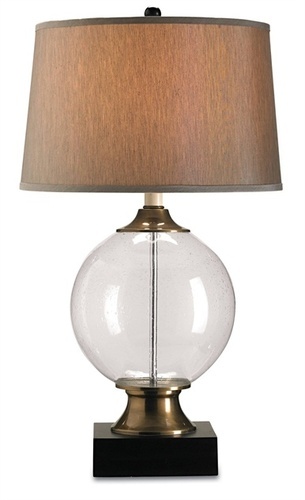 Its traditional spherical base is girdled by brass accents and sits atop a Black footing. Complementing the neutral palette of the lamp is a Silver Shantung shade. Silver Shantung Shade measures 16"x16"x11.5"
Takes one 150 watt bulb. Ships FedEx ground. Eligible for return or exchange with 15% restocking fee. Please view our return policy for more information. We're happy to answer any question that you might have about our products. You are also welcome to call us toll-free at 844-677-6604. Be The First To Know Get exclusive information on new products, promotions & beach home decor tips.